Remember the Rubik’s cube? The “impossible” to solve but annoyingly addictive puzzle game that can consume hours of your time without the slightest hint of progress. The one that, even one you have the top two layers solved, you still need to undo almost everything you previously did to get the last couple pieces into place. That Rubik’s cube. That is the Rubik’s cube that has puzzled me for years (bad pun alert!). I’ve picked up some tips and tricks over the years and can solve a single side quickly and without much trouble, but I could never master that second layer – and I haven’t even attempted the final layer. I have always been content that I was smart enough to teach myself how to begin the solution and I always figured that I would just figure out the rest eventually. But as I grew up, I played with the cube less frequently and my cube-solving abilities never improved. And then M came along. Walking through the toy aisle at Target one day (yes, grown ups do that too), we passed the Rubik’s cubes and M had to have one. So, it made its way into our cart and into our lives. Initially M had no Rubik’s skills. (Which was particularly great because M is good at everything.) He puzzled over the cube awhile without making progress and I blew him away with my rudimentary cube-solving skills. And then things changed. You see, there is this whole world of Rubik’s cube obsessed people on the internet. 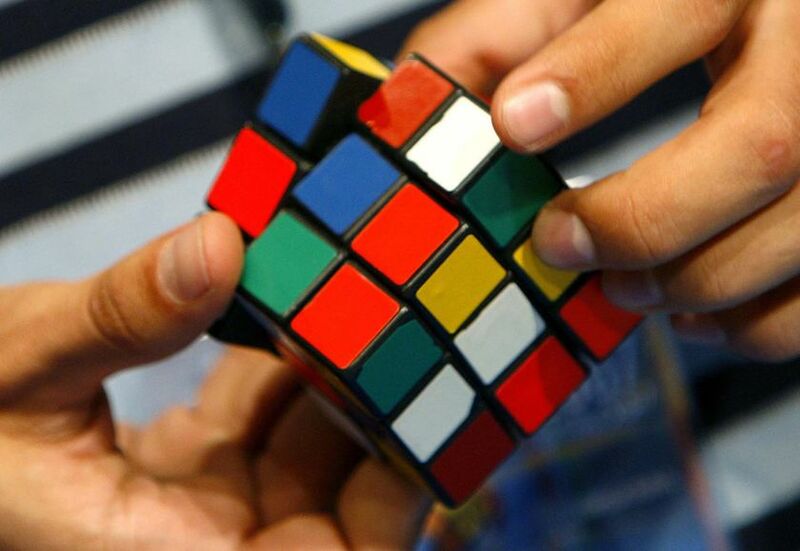 The Rubik’s cube is the holy grail of Math puzzles as the solutions are often based in Group Theory. Being a bit of a math nerd myself, I had dipped my toes into this world a little, but never made any real effort to utilize the group theory to enhance my puzzle solving abilities, I just grabbed a few pointers and continued to think I would figure it out on my own. M, however, saw this online gang of puzzle solvers and chose to use their collective knowledge to his benefit. After about a week of memorizing algorithms and practicing, he can now solve the Rubik’s cube without much thought. Now he’s shopping online for a 4×4 Rubik’s cube and a new challenge. Diabetes is like the Rubik’s cube. While there is no ultimate solution to make D go away, there are a series of steps to take or rules to follow that eventually put all of the blocks in their correct places. I spent years with D thinking that I would figure it out eventually, thinking that if I just kept doing what I was doing, everything would just fall into place one day. I didn’t realize that I would have to undo a lot of what I had already done – like learn new ways to bolus, adjust basal rates, etc – in order to click the last layer of blocks into place. It’s hard to look at a cube with 46 out of 54 blocks in place and want to attempt the final layer. Perhaps more importantly, I didn’t realize what a vast collective-knowledge existed on the internet to help me find better ways to solve the puzzle. After opening my mind, and my browser, to all of the tips and tricks that the DOC has to offer, I found that with a little memorization of “algorithms” and a lot of practice, I am now equipped to “solve” the Dia-Rubik’s cube. It’s intimidating, yes. But, like with any puzzle, the more you practice and utilize tips and tricks, the solution will becomes second nature. And, like with the Rubik’s cube, when someone or something inevitably comes along and the pieces get moved out of place, the solution won’t be as difficult the second (or third or fourth…) time around.